When it comes to summer cooking, we have a pretty strict family policy: Do everything you can to avoid turning on an oven. Which is all well and good except that it clashes with our other family policy: Eat pizza once a week. By pizza, we don’t mean the takeout pie from Tony’s on Main Street or the personal pans the kids get on Fridays at the school cafeteria. We’re talking pizza – made, when possible, with a homemade crust — that may or may not include cheese, is topped with fresh ingredients (potatoes and bacon, arugula and ricotta), and can bring even the most reluctant eater (e.g., Abby) to her little knees with gratitude. In our minds, pizza is the ultimate family dinner – you can have three entirely separate meals on one crust and still, if you close your eyes, pretend that you’re all eating the same thing. But to keep our strict family pizza policy intact this summer, we had to learn how to do it without turning on the oven. We had to learn to cook it outside. This took some doing. We burned a lot of crusts, and yet, we fought on, grilling pizza after pizza after pizza until we got it right. Here is what we learned. 1. Oil Everything. If the crust sticks to the grate, you’re done. Avoid this by brushing the grate and both sides of the crust with olive oil. 2. If you have an extra set of hands, avail yourself of them. When laying the crust on the grate it’s much easier to keep it stretched out when two people hold opposite sides and lay it down together. Or divide dough in half and grill smaller pizzas. 3. Don’t roll your crust too thin. One, it will burn too quickly, and two, it will rip as you try to move it from the baking sheet to the grill. 5. Pre-cook Your Toppings. If they need to be wilted or browned, it’s best to do it on the stovetop before you add to the pizza. Without top heat, and with such a short cooking time, you’ll end up with raw, uncooked vegetables. Cheese should be finely shredded or sliced paper thin whenever possible. The pizza below has you fry your tomatoes and onions before you start grilling. 6. Three words: slow and low. This is crucial: let the coals die way down before you put the crust on the grill. The coals should be gray all the way through and no flames should be coming up. Until we figured this out, too much heat wrecked us every time. Slice 2-3 green tomatoes ¼ inch thick. Season with salt and pepper. 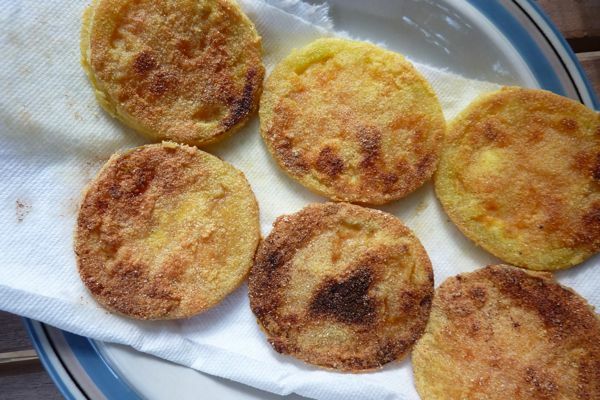 Dredge each slice in one whisked egg, ½ cup cornmeal, ¼ teaspoon cayenne, salt and pepper to taste, and fry in two tablespoons of olive oil until crust is golden, about 2 minutes a side. Drain on paper towels. In a large skillet set over low-medium heat, add 3 tablespoons olive oil and 1 large onion (sliced), salt and pepper, and cook until caramelized, about 15 minutes. Stir in 1 teaspoon balsamic vinegar and remove from heat. Prepare grill: Spread hot coals evenly over the bottom of grill and let burn until heat is relatively low, about 30 minutes. There should be no flames coming up from the coals. Place first rolled dough flat on the grill very carefully. (You may need to enlist a partner in this, as the dough stretches and makes this hard with just two hands.) Lift up each corner with your spatula as crust cooks (to make sure it’s not sticking) and flip when bottom looks golden but not burned, not more than 2 minutes. Flip onto an oiled cookie sheet, grilled side up. Using a spoon, spread pizza sauce on top, then dot with mozzarella. Return to the grill, cover, and grill until cheese has melted and bottom of crust looks golden but not burned, another 2 minutes. Grill second rolled dough as directed above. When it has been flipped onto oiled cookie sheet, sprinkle with provolone and return to the grill. Cover and cook until cheese has melted and bottom of crust has cooked. Top with green tomatoes and caramelized onions. Though this arugula-ricotta pizza you’re looking at wasn’t grilled, it would be a good choice for grilling because you add the toppings after the crust is done. Grilled pizza is so perfect! We have a hard time with is too. PS: I read your newsletter, do I win the wine? I will have to try this sometime during the summer. The only thing my 2.5-year-old son wants to eat these days is pizza, pizza, pizza. It will also give my husband an excuse to bust out the grill (which he loves). Thanks for the great tips! I agree with your comment about laying the crust on the grill and in the past have done a few, smaller pizzas to make it easier to manuver. Thanks for the other suggestions. PS: I read your newsletter, do I win the wine? Loved the pizza on the grill…we tried it a few weeks ago because it was too hot here to cook inside and loved it…planning on doing it again soon..thank you for some more good ideas!!! We love grilled pizza. Similar to Andy’s post about the chimney starter (which is a necessary tool for us too! ), the pizza stone has become our best friend. p.s. Just subscribed to the newsletter! It’s the transfer that kills me every. single. time. I make pizza. I always seem to fold the pizza in half. PS: I read your newletter, do I win the wine?! Perfect alternative to cranking the oven up to 500 when it’s close to 90 outside. good idea! we might have to try this over the weekend… PS: I read your newletter, do I win the wine?! Last summer we were all about the grilled flatbreads, this is pizza summer! Thanks for the reminder. P.S. I read the newsletter, do I win the wine? Grilling pizzas is one of those mysterious things that I cannot bring myself to do, but this definitely sheds some light on some of the tricks. Since you have a charcoal grill do you think your techniques could be used for a gas grill? I LOVE LOVE LOVE grilled pizza. We just had it for dinner the other night and it’s a sort of staple for us in the summertime. Yum! PS I read the newsletter, do I win the wine? We live in south Florida, where the season of “please, please, please don’t make me turn on the oven” is a little longer than average (say the vernal equinox to Thanksgiving). We make pizza on the grill quite often, but I have to admit to cheating by using a pizza stone right on the grill. It’s fabulous – and can be used to for foccacia, breads, tortillas, etc. as well. I think the advantage of using the stone is that you can make those impossibly thin, blistered crusts (which we love in our home) and any given pie only takes a few minutes. Love the pizza on the grill! fried green onions ~ yum. YAY– so we CAN make pizza even though it’s 90+ degrees outside! Thanks for all your trials so that we can get it right on the first try (hopefully!). I am also a big fan of pizza! Haven’t tried grilling it yet, though. We’ll have to try that! I convinced DH to grill pizza the other night. Whole wheat crust, toppings ranging from traditional pepperoni, to caramelized onions and fried egg (so. dang. yummy). Came out great! It’s the start of a beautiful relationship. I’m with you on avoiding the oven…I’ve been grilling whole chickens and anything else. But not thought of pizza, will be trying these beauties soon. We have a gas grill, yes it’s not as awesome, but easier to operate for a quick dinner grill here and there. I have found that kneading a small amount of cornmeal into the store bought dough has some benefits for handling on the grill. Don’t exactly know why- or why we started but thought it worth mentioning. Yup – Grilled pizza tonight and baby backs this weekend. Plus the mustardy potato salad. Plus dark and stormies. And I might try my hand at the grill this weekend – it might get crazy. 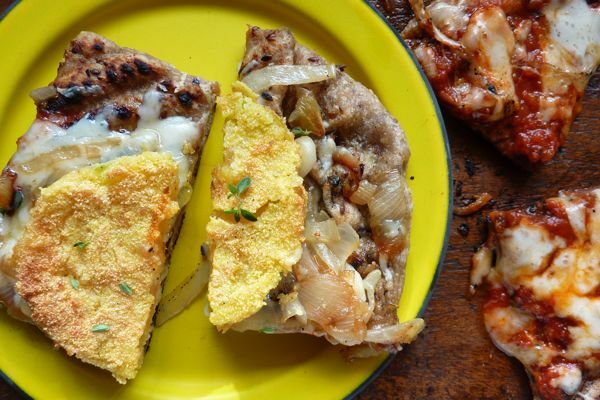 I am too darn scared to attempt grilled pizza and I am also working off a gas grill, but I have been inspired by this post (especially just sneaking by with store bought dough!). I think I may break it out for the weekend. Mmmm… prusciutto and mozzerella sounds divine. My sister and I have been wanting to try grilled pizza for awhile. Hopefully we will get the opportunity before the end of summer. Ahhhh….right- that’s what I should have done. I’ve grilled pizza a bunch of times, but I should really turn down the heat a bit. There’s some burning going on before the insides are really as done as I’d like. Thanks! Oh, and that arugula ricotta looks great. We were just talking about the pizza at our foodie oriented little swim club. I will pass this along. Thanks. We just taught ourselves to make pizza on the grill a couple weeks ago using your Lahey pizza dough. Its so yummy! We’re remodeling our ktichen and without an oven so we were forced to be inventive and take our pizza outside. We found wrapping the pizza dough (pre-oiled) on a rolling pin, helped get it to the grill in one piece. My boyfriend first introduced me to the joys of grilled pizza and it may be my favorite thing in the world now. Another piece of advice I would add is to only put a few toppings on the pizza. Too many and the pizza overflows and isn’t so delicious. Keep it simple. 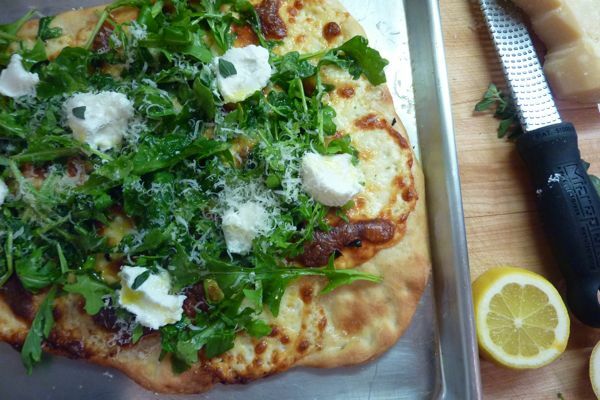 I am loving the look of the arugula-ricotta combination! LOVE these types of pizzas….now if I can convince my kids I will be golden. They do already love pesto sauce instead of red sauce, but that’s as far as they will venture away from plain old cheese pizza. Great idea – pizza with even more fun! Have you tried baking it on a sheet of aluminium foil?